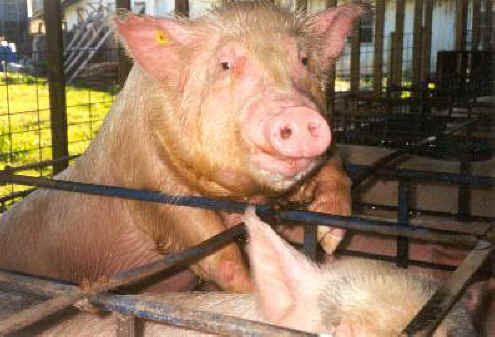 (Pig Exploitation - Gestation Crates - 02) This female pig is attempting to escape from the severe confinement of her gestation crate. There are also noticeable abrasions above her eyes from rubbing her head against the bars. Her life is no different than ours would be if we were forced to live in a coffin all our lives. It is living hell!